An international team of astronomers has discovered an “unusual” star system that is comprised of the oldest known star hosting planets, 11.2 billion years old. To compare, the Big Bang is considered to have happened 13.8 billion years ago. 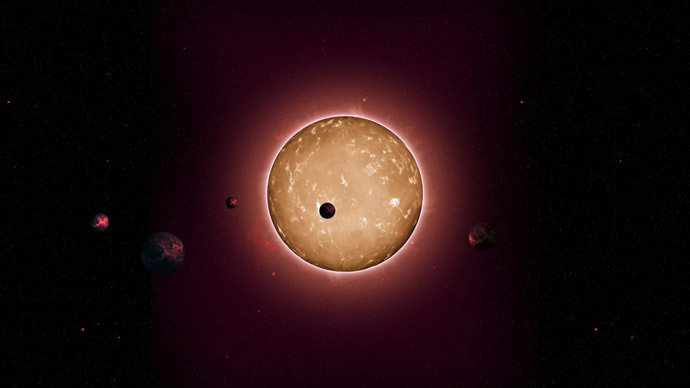 The discovery of an ancient star located 117 light-years from Earth, was based on observations made by NASA's Kepler satellite, and was announced on Tuesday in the Astrophysical Journal by scientists from Europe, Australia and the US. The oldest star to have been found so far hosting planets slightly smaller than the Earth, Kepler-444 has five planets orbiting it. Their sizes vary between those of Mercury and Venus, and they orbit their parent star in less than 10 days, at less than one-tenth Earth's distance from the sun. The lack of liquid water and high levels of radiation make them uninhabitable, scientists revealed. “This tells us that planets this size have formed for most of the history of the universe and we are much better placed to understand exactly when this began happening,” he added. To find out the age of the system in the Constellation Lyre, the team used the method of asteroseismology, which provides a tool to determine the internal structure of stars by their pulsation frequencies, while the sizes of planets is measured by the fading in intensity of the star’s light, caused by passing across its face. “We now know that Earth-sized planets have formed throughout most of the Universe's 13.8-billion-year history, which could provide scope for the existence of ancient life in the Galaxy,” leader of the research at the University of Birmingham Tiago Campante said. “When asteroseismology emerged about two decades ago we could only use it on the sun and a few bright stars, but thanks to Kepler we can now apply the technique to literally thousands of stars,” said Huber. "We're another step closer towards finding the astronomers' holy grail - an Earth-sized planet with a one-year orbit around a star similar to our sun," Huber concluded. NASA’s space telescope Kepler was launched in 2009, and it has since discovered over 1,000 confirmed exoplanets in about 440 stellar systems. Its mission targets Earth-like planets outside our solar system.